The sear took away all of Wei WuXian’s attention, making him doubt that he had mislooked. He couldn’t even pay attention to the person’s face, and his breaths also stuttered for a few times. Suddenly, a flash of white appeared before his eyes, as if snow had fallen before him. Quickly afterward, the blue glare of a sword penetrated through the snow, slashing toward him with an arctic blast of wind. Who didn’t know that it was HanGuang-Jun’s famous sword— “Bichen”? Crap, it’s Lan WangJi! He would love to be thrown off the mountain, but wouldn’t want to be silenced. Wei WuXian couldn’t understand it at all—since when did the Lan Sect tolerate something as shameless as peeking at one of the Lan Clan’s most distinguished cultivators bathing?! Lan WangJi carried him to the jingshi, walked straight toward the inner room, and threw him down onto the bed with a thump. Wei WuXian yelped from the pain. He couldn’t get up at the moment, wriggling upright after a while. He originally wanted to whine a few times in a flirtatious manner, so that he would detest him. However, as he raised his head, he saw that Lan WangJi was holding Bichen with one hand, looking down at him commandingly. He was used to seeing Lan WangJi with his forehead ribbon, neat, long hair, scrupulous to every detail, but had never seen him like this, with his hair a bit loose and wearing thin clothing. Wei WuXian couldn’t help to glance a few more times. After the effort of carrying and throwing him on the bed, Lan WangJi’s collars, which were closed in the beginning, came slightly apart, showing his distinct collarbones and the deep red sear under them. As he saw the sear, Wei WuXian’s attention was captured again. When he hadn’t become the YiLing Patriarch yet, he also had a sear like this on his body. And, the sear on Lan WangJi’s body was exactly the same as the one on his body in his past life, no matter the position or the shape, so it was only natural for him to recognize it and become surprised. Speaking of it, aside from this sear, the thirty-or-so scars of the discipline whip on his back were also surprising. Lan WangJi became famous at a young age. With his high appraisal, he was one of the most acknowledged cultivators in the cultivation world, and also part of the Two Jades of which the GusuLan Sect was so proud of. Every word and action of his was set as examples of excellence by the elders of each sect for their disciples. Just what unforgivable mistake did he make for him to be punished like this? Seeing from the thirty-or-so scars of the discipline whip, the executor might as well have killed him. As soon as the discipline whip had been delivered, it wouldn’t disappear for the rest of the bearer’s life, so that they would remember it forever and never make the same mistake again. Following his gaze, Lan WangJi lowered his eyes. He pulled his collar so that it covered his collarbones and sear, becoming the indifferent HanGuang-Jun once again. At the moment, the deep toll of the bell came from far away. Without giving Wei WuXian a chance to reply, he turned to another compartment of the jingshi, leaving Wei WuXian alone, sprawled on the bed alone and feeling confused. He did doubt that Lan WangJi might have guessed who he was. However, the doubt was lacking in both sense and reason. As sacrificing one’s body was a prohibited practice, there were probably not a lot of people who knew about it. The scrolls passed down the generations were most likely partial pieces of the entire work, unable to reach their full potential. Things continued like this, and so there were less and less people who believed in it. Mo XuanYu only summoned Wei WuXian by looking at a secret scroll, wherever he found it in the first place. Anyhow, Lan WangJi couldn’t have recognized him just from the awful flute melodies that he played. He asked himself whether or not he had a heartfelt relationship with Lan WangJi in his past life. Although they had studied with each other, went on adventures, and fought together, all of these experiences were like falling petals and flowing water—coming and going. Lan WangJi was a disciple of the GusuLan Sect, which meant that he had to be “righteous,” quite incompatible with Wei WuXian’s personality. Wei WuXian thought that their relationship wasn’t exactly bad, but it wasn’t that good either. The chances were that Lan WangJi’s opinion of him was the same as everyone else’s—being overly wanton and not virtuous enough, it would have been only a matter of time before he caused a disaster. After Wei WuXian betrayed the YunmengJiang Sect and became the YiLing Patriarch, he had a few significant disputes with the Lan Sect, especially during the few months before his death. If Lan WangJi was sure that he was Wei WuXian, they should have already been engaged in a large-scale fight. Yet, he wasn’t sure what to make of the current situation—in the past, no matter what he did, Lan WangJi didn’t tolerate anything, but now, even though he used whatever methods he had up his sleeve, Lan WangJi could still tolerate him. Should he be congratulated because of his progress?! After a while of staring at nothing, Wei WuXian turned around and went off the bed. He lightly moved to the other chamber. Lan WangJi lay sideways on the bed, appearing to be already asleep. Without making a sound, Wei WuXian approached him. He was still not giving up, hoping to fish the jade token for passage out of him. However, as he just extended his hand, Lan WangJi’s long lashes fluttered, and he opened his eyes. Wei WuXian quickly made up his mind. He threw himself onto the bed. He remembered that Lan WangJi hated physical contact with other people. In the past, just with one touch and the offender would have been hurled out. If, even like this, he endured it, then the person was definitely not Lan WangJi. He would even doubt that Lan WangJi’s body was taken! Wei WuXian’s entire body was above Lan WangJi’s, with legs separated, kneeling with one on each side of his waist. 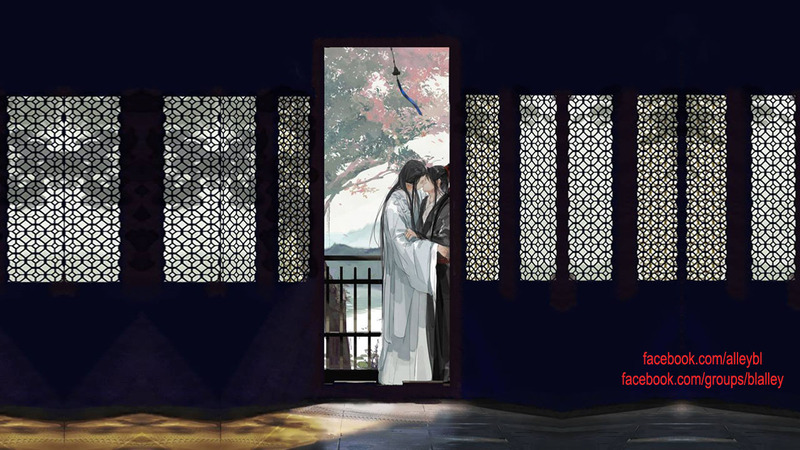 His hands were against the wooden bed, trapping Lan WangJi in between his arms. He gradually lowered his head. The distance between the two faces became closer and closer. Closer and closer. At the point where it became hard for Wei WuXian to breathe, Lan WangJi finally opened his mouth. “…” For some reason, Wei WuXian felt that he should carefully consider his reply. As he was about to curl his lips into a smile, a numbness suddenly came from his waist, and his legs gave out. With a thump, he fell onto Lan WangJi’s body. The curvature of a half-smile was frozen on his lips. His head was at the right side of Lan WangJi chest and he couldn’t move at all. Lan WangJi’s voice came from above him. His voice was low and deep. His chest vibrated slightly as he spoke each word. Wei WuXian didn’t expect it to end up like this at all. He shifted around, wanting to get up, but his waist continued to ache and felt limp. He could only be attached to another man in such an awkward situation, feeling a bit befuddled. Just what in the world happened to Lan Zhan in the past few years, turning him into a person like this? Was this the same Lan Zhan as before?! Shouldn’t he have been the person whose body was seized?!?! Suddenly, as his thoughts were as jumbled as a hurricane, Lan WangJi slightly shifted. Wei WuXian’s spirits lifted, assuming that he finally couldn’t bear it any more. However, Lan WangJi simply waived his hand. Three-hundred taels are not buried here: This is a very famous proverb in China. It tells the story of a man who buried his money under the ground, and added a sign that said something along the lines of “three-hundred taels are not buried here”. This is an example of someone conspicuously protecting his innocence and making a very poor lie. Cun: This is pronounced like tswun instead of kahn. Do not mistake the n with an m, or else you will be confused. Wooden bed: In the past (and in traditional households in the present), beds are hard and made of wood. Thickened his face: As most of you probably know already, to lose face means to embarrass oneself. To thicken one’s face, on the other hand, means to be not afraid of losing face, pretty much saying that one has too thick of a face to lose any layers. HOT: Korea will remake 'ShangYin/Addicted"